Native fish have withstood one of the worst droughts on record in the Glenelg River thanks to environmental watering in 2015–16. Fish monitoring shows that fish diversity remains high in the Glenelg River despite extremely dry conditions, during which much of the river was reduced to a series of large-but-disconnected refuge pools between November and May. "The biggest threat through the last year was that water quality in refuge pools would deteriorate to the extent that stranded fish die. Environmental watering aimed to protect fish from poor conditions," explains Bryce Morden from Glenelg Hopkins Catchment Management Authority (CMA). "Environmental water delivered over summer improved conditions in refuge pools in the upper Glenelg River through to Dergholm. This also provided a short-term connection for fish to move between the pools." In a surprise find, estuary perch and tupong were found this year as far upstream as Fulham Reserve near Balmoral. This is a distance of 330 km upstream from where they start life in the estuary at Nelson. "The Fulham Streamside Reserve is a very popular camping area with bush running to the edge of several long, deep pools. The reserve now has a new drawcard, with estuary perch a native fish species popular with anglers," Bryce Morden from Glenelg Hopkins CMA says. The importance of protecting refuge pools during drought years was highlighted to over 100 people who attended angler engagement field days along the Glenelg River. Community and local angling club members aged from three to 80 watched CMA and research staff demonstrate how they monitor fish. 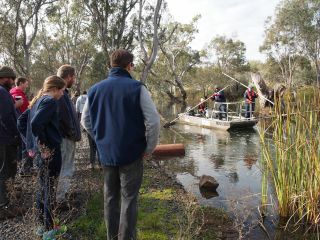 They then discussed the benefits of environmental watering for native fish with representatives of the CMA, the VEWH and Austral Research and Consulting. 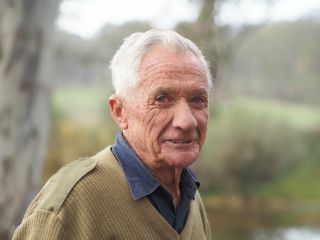 Harrow sheep farmer, Lachie Turner (below) says, "The Glenelg River is the best I've seen it for 50 years."